here is a large open kitchen and formal dining room to gather and cook a light breakfast or gourmet feast. 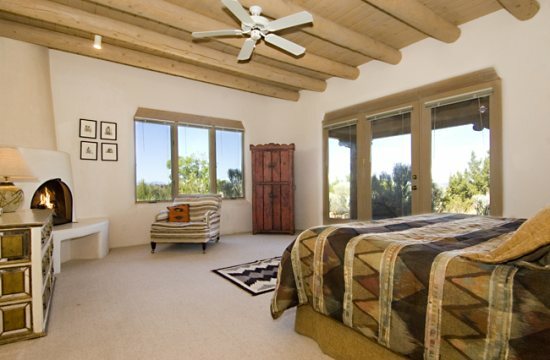 The bedrooms are nicely appointed with a traditional Santa Fe flavor. The master bedroom is privately situated off the living area and offers a king bed and luxurious bathroom including double sinks, walk in shower and tub (Jacuzzi jets are not functioning). Refrigerated air conditioning cools you off during our lovely summer months. 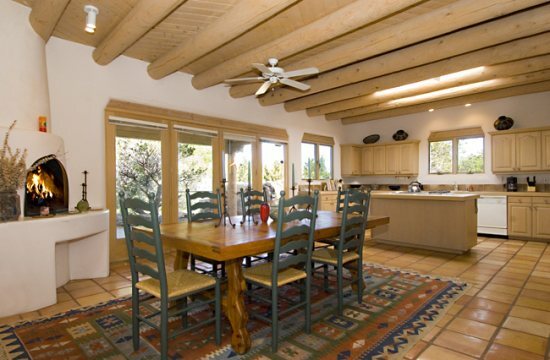 Nestled into a hillside off Gonzales Road, this exquisite pueblo style home offers close proximity to both Canyon Road and the road to the Santa Fe Ski Basin. The plaza is only a mile away. In the Espiritu de Santa Fe you will find the spirit of Santa Fe. This home is available only for 30 days or more and does not permit pets.